Do you want to quit smoking? Have you “tried everything” but still smoke? Smoking can be one of the hardest things to quit but hypnosis can make it so much easier! 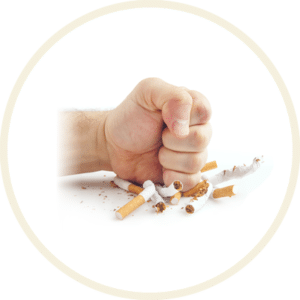 The biggest problem smokers face is dealing with breaking the habit of smoking. Habits are formed by your conscious mind actively deciding to do an activity. The longer your mind decides to do it, the more programmed it becomes in your subconscious. Changing your subconscious mind can be next to impossible on your own. Hypnotherapy is simply the act of reprogramming your subconscious mind. Not ready to quit? Often times people will try to quit because their doctor told them they have to, their spouse or other family member is begging them to, or they understand the health risks and “know” they should but don’t want to. Hypnosis alone will not work in these cases. However, coaching can be the answer! Let’s explore why you smoke, why you don’t want to quit, and any fears you might have. Through coaching, you can find the will to want to quit.